We were notified late yesterday, by the Texas AFL-CIO, that the Central Texas Food Bank is having a difficult time keeping food on their shelves, due to the additional Federal Employees who have now been out of work for over a month. 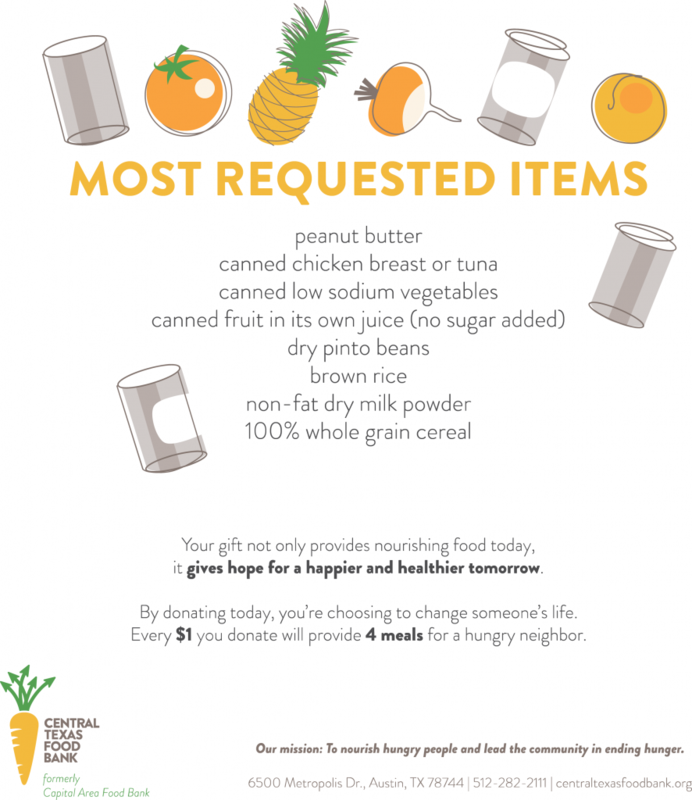 Please, speak to your coworkers and coordinate to bring in food for pickup at your work location. We plan to pick up the donations on Friday, January 25th, 2019. We know that this is not very much time, so it is important to communicate quickly and effectively to see if we can accumulate as much as we can. The Central Texas Food Bank is a 501(c)(3) nonprofit organization providing healthy meals and programs to Bastrop, Bell, Blanco, Burnet, Caldwell, Coryell, Falls, Fayette, Freestone, Gillespie, Hays, Lampasas, Lee, Limestone, Llano, McLennan, Milam, Mills, San Saba, Travis and Williamson counties. The NettWorth Financial Group Donna Castleberry Scholarship awards college scholarships to children of union members across the country. Since 2001, more than $220,000 has been given to fund the education of dozens of promising young men and women. Chances are you know of a family that has benefited in your hometown. The scholarship program is a fitting tribute to an individual who gave so much to so many. Scholarship applications can be requested by calling our scholarship hotline at 888-224-5021 or by visiting our website www.nettworth.net. 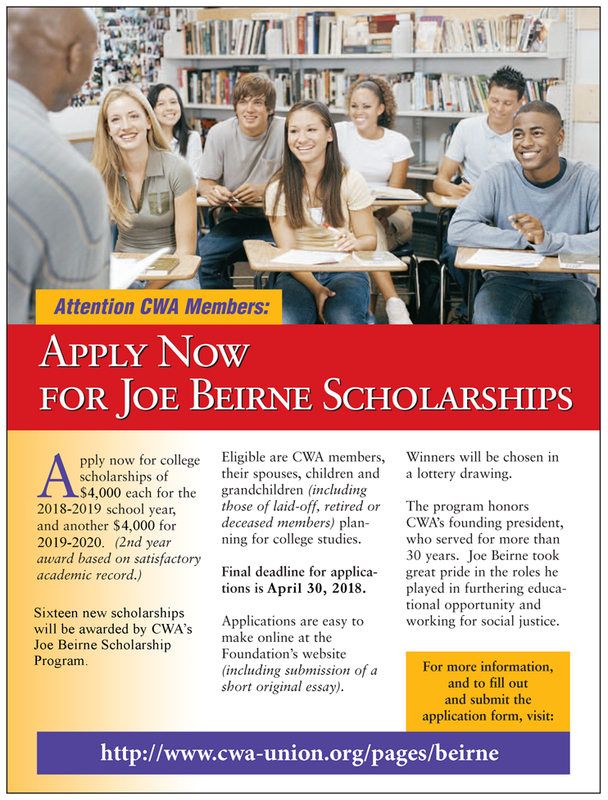 Scholarship applications must be submitted by May 31, 2019. To learn more about the NettWorth Financial Group Donna Castleberry Scholarship, please contact us at your convenience. Union members who have a child about to complete their senior year of high school are eligible to apply for a one time grant of $1500. The postmark deadline to apply is January 31, 2019. Please attend our monthly membership meeting this Thursday, January 10th, at 7:30pm. We thank you for your patience. As of today, our phones have been ported to the new location. As a reminder, our annual Christmas Party is this Friday beginning at 6:30pm. All members and their families are welcome. Please be advised that we have moved to 601 Williams Street 609 Canion Street, Austin, TX 78752. Our Membership meetings from this point going forward will be at the new location. ***ATTENTION*** We are still in the process of moving our phones from the old location. If you cannot reach us, either leave a message, or contact your Steward or Chief Steward. Thank you for your patience. Today’s Supreme Court decision on the Janus v. AFSCME case marks a sad day for all working people. This decision continues a long campaign by corporate interests and right wing groups to restrict our ability to stand together. While these special interest groups might be celebrating their victory against workers’ freedom to join together in strong unions to speak up for themselves, their families, and their communities, union members will be using this as a rallying cry to fight back harder than ever before. The right-wing attack on union fair share fees is all about making it more difficult for working people to defend themselves when corporations abuse their power. Today’s decision is an attempt to further concentrate power in the hands of the wealthy few by taking away resources from working people who are represented by unions. But there’s something happening here in America. We’ve seen it from CWA members as workers at Verizon, AT&T Mobility, Frontier Communications, and Momentive Performance Materials have gone on strike and won gains through strong collective bargaining. Our public worker membership is growing, even in states like Texas that prohibit collective bargaining for public employees. We’ve stood in solidarity with teachers and other public employees in many different states walking out and standing up to special interests – and winning. Corporate special interest groups have been working for decades to strip away workers’ freedom to join together and negotiate for fair wages and benefits, and to improve our workplaces. They want to turn back the clock on achievements like Social Security, civil rights, wage and hour and safety laws, Medicare, and public education that unions fight every day to preserve. Union members will show them that nothing can stand in the way of working people standing together. We call on elected officials at the local, state and national level to stand with working people and make it easier for them to join together in unions. This morning the Local Election Committee counted the ballots for the vacant Chief Steward for Marketing position. The final results conclude that Cheryl Lee won by majority vote. The detailed results will be posted on the bulletin board at the Union Hall.